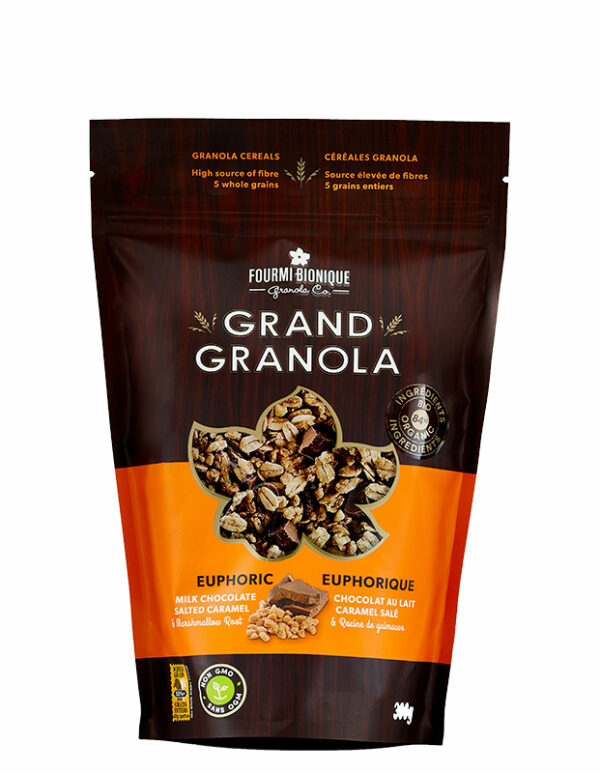 What a pure taste of happiness this granola blend made with organic cereals sourced from Quebec. The Grand Granola Euphoric blend combines soft notes of salted caramel, creamy milk chocolate and a dash of marshmallow root, for an unforgettable experience. A true exaltation of the senses, this gourmet blend of granola, roasted with Quebec honey, brings back childhood memories of sweet mornings. A taste of caramel and milk chocolate that goes perfectly with vanilla or natural yogurt. Perfect for a dessert that is both nourishing and tasty. To extend the pleasure, try it in one of our delicious granola recipes. 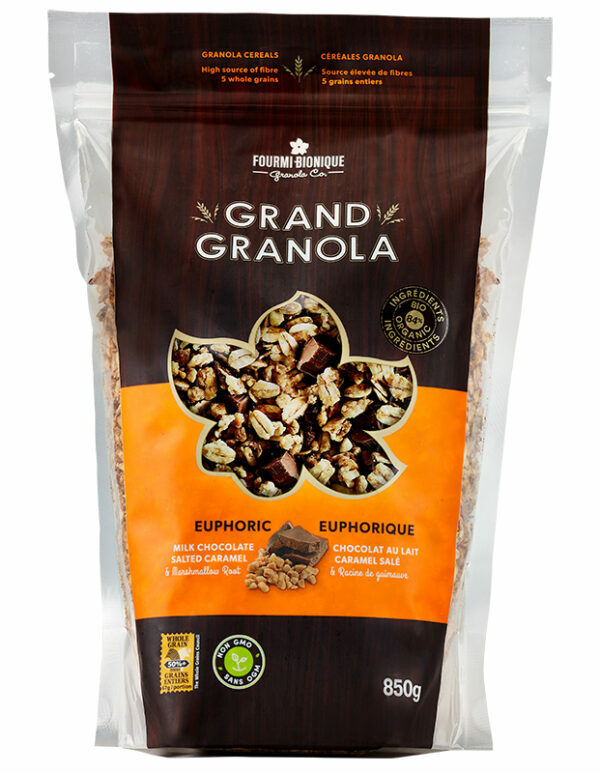 The Grand Granola Euphoric is also available in an economic and recyclable bulk packaging. Rolled oats*°, Sugars (honey°, cane sugar*), Whole spelt flour*°, Sunflower oil and/or Canola oil, Rolled rye*°, Rolled barley*°, Butterscotch and sea salt milk chocolate*¹(whole milk powder*, golden cane sugar*1, cocoa butter*1, cocoa mass*1, butterscotch bits*, whole cane sugar*1, hazelnuts*, sea salt, ground vanilla bean*1), Oat bran*°, Tamari* (water, soybeans*, wheat*, salt), Coconut*, Flax seeds*, Sesame seeds*, Natural flavour, Cocoa powder*1, Marshmallow root powder*. May contain almonds, cashews, macadamia nuts, pecans and ingredients made in a facility that processes peanuts. Soft creamy milk chocolate sweetly marries with the deep caramelized salted caramel, bringing contrast with a crunch. Crunchy excitement, like the earth beneath your feet on a dew-kissed morn’.